This time of year is always so much fun and everyone’s favorite. For me, it’s been a little bitter sweet and filled with mixed emotions. All though their due date was in January, our girls most definitely would’ve made their grand entrance some time in December had we made it full term so I imagine this time of year will always bring reminders of that. Although they can’t be here with us to see the magic of the season unfold in person, we know they’re always close in our hearts and that’s reason enough to celebrate this time of year just as we always would. I didn’t put much thought into this year’s décor. 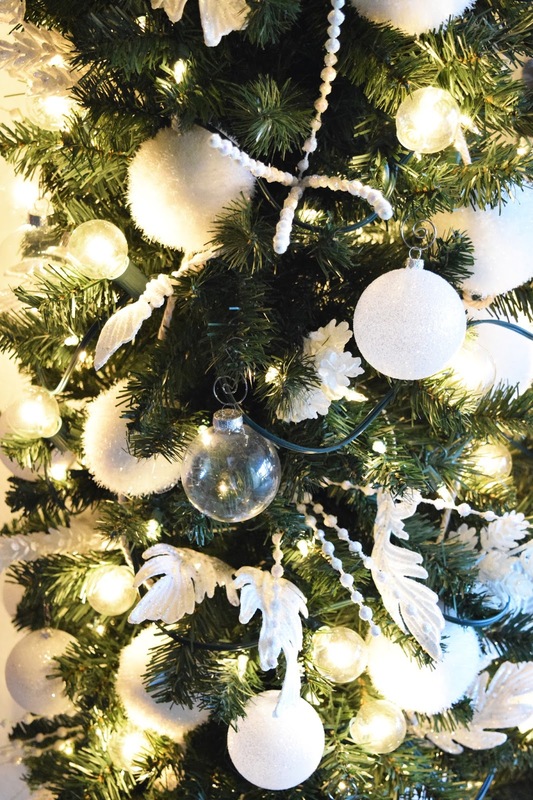 There’s no theme other than deciding to do an all-white tree. 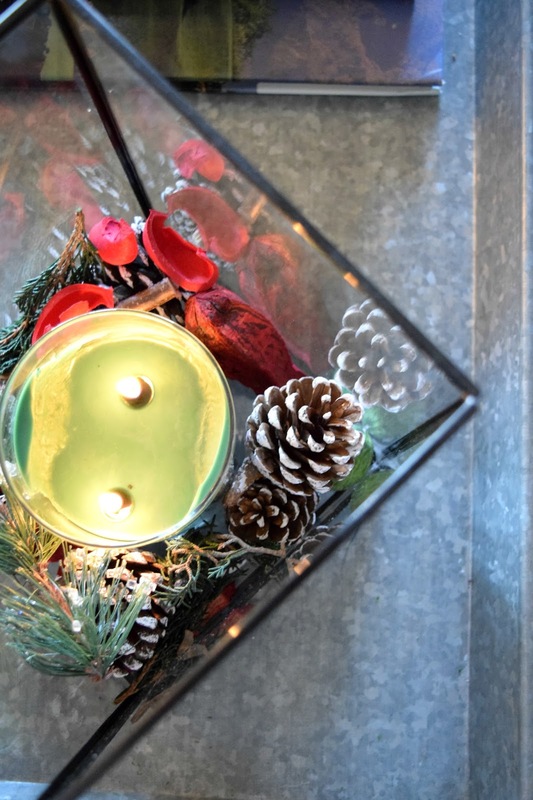 Much of what we used this year is the same items we’ve used in years past, just pared down…if that’s possible to do while decorating for Christmas. I have four giant bins of Christmas décor and found that I used the contents of maybe two of those bins. This tells me it’s time to purge what isn’t being used. 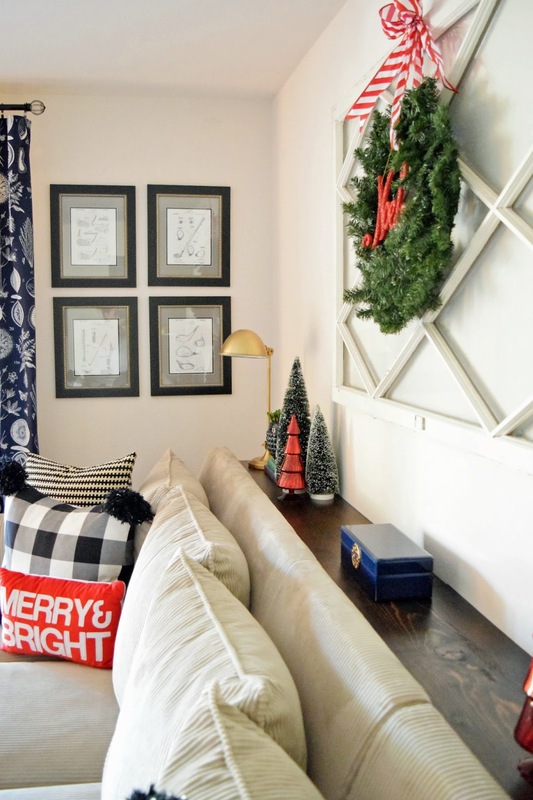 But enough chit-chat…let’s dive head first into our “traditional” Christmas décor around the apartment. 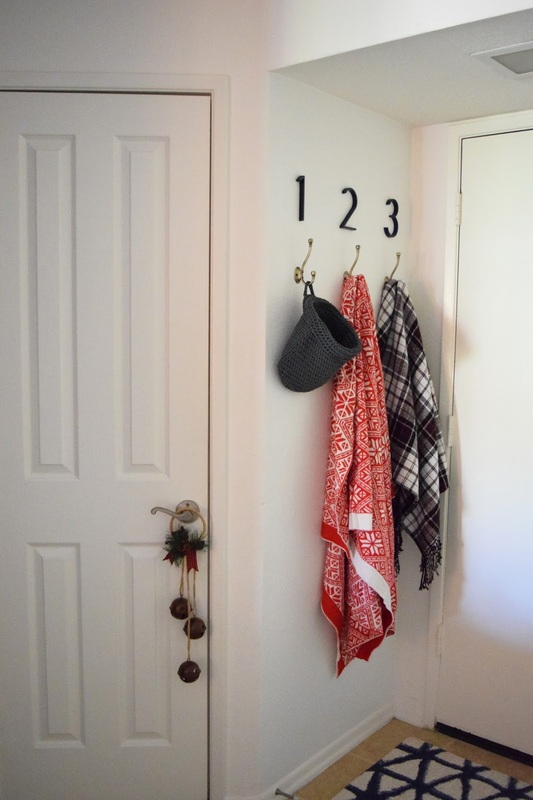 Our entryway received a subtle nod to the season with a couple holiday print throws for a festive touch. I’d love to find an old pair of ice skates to hang here as well. 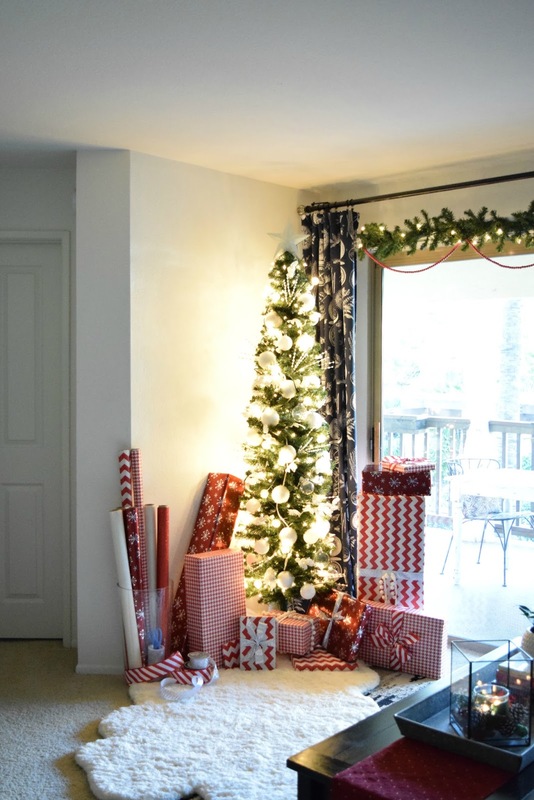 The view of the tree is the first thing you see as you walk in through the front door. To the left of the tree we have our TV and media cabinet in the nook. 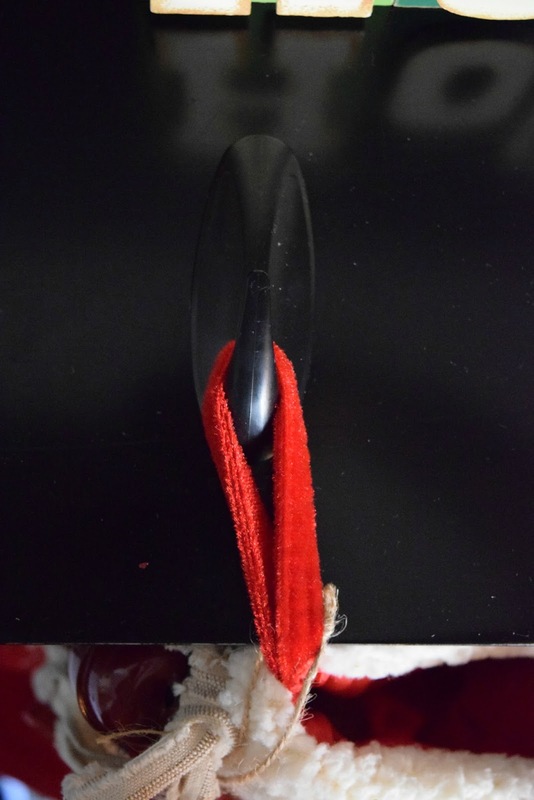 Without a traditional mantel, I hang our stockings from the cabinet using black 3M Command Hooks (every renter’s best friend). Works like a charm! 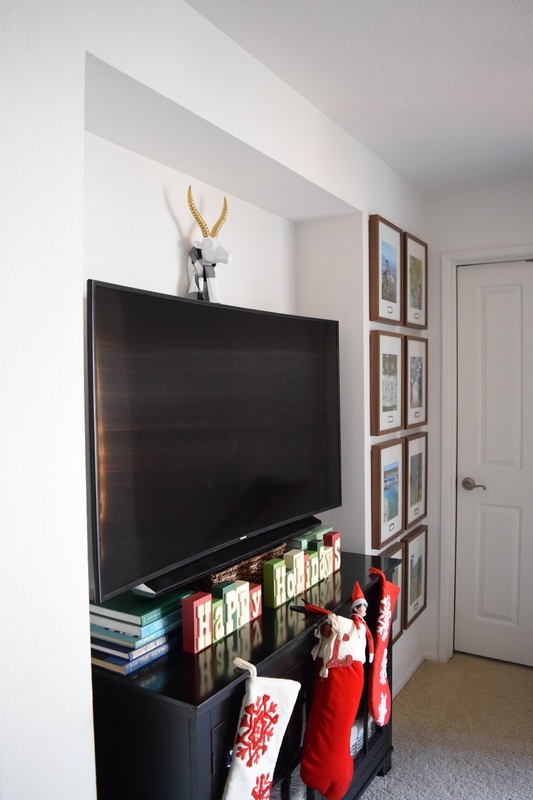 Our friend Anthony the antelope who lives above the TV got into the holiday spirit as well with a scrap piece of fabric tied around his neck as a scarf. 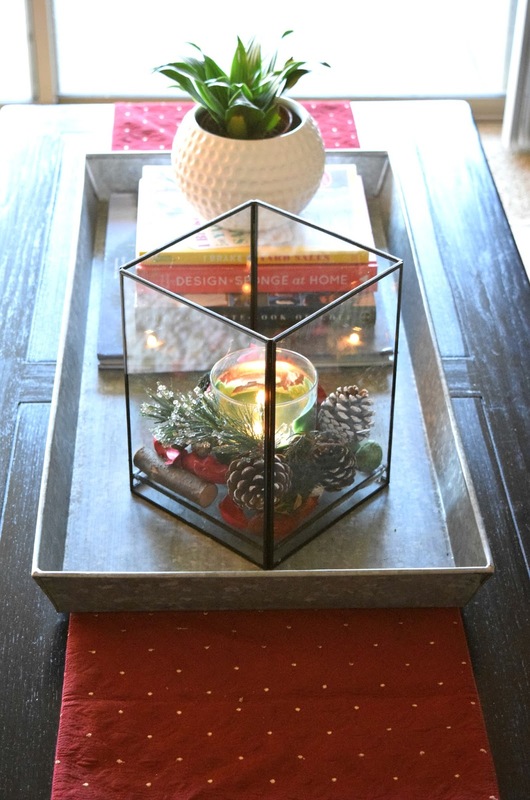 The coffee table got a dose of Christmas cheer too with a red runner, a pine scented (the best!) candle, and some season appropriate vase filler. The couch wall received the most holiday décor. 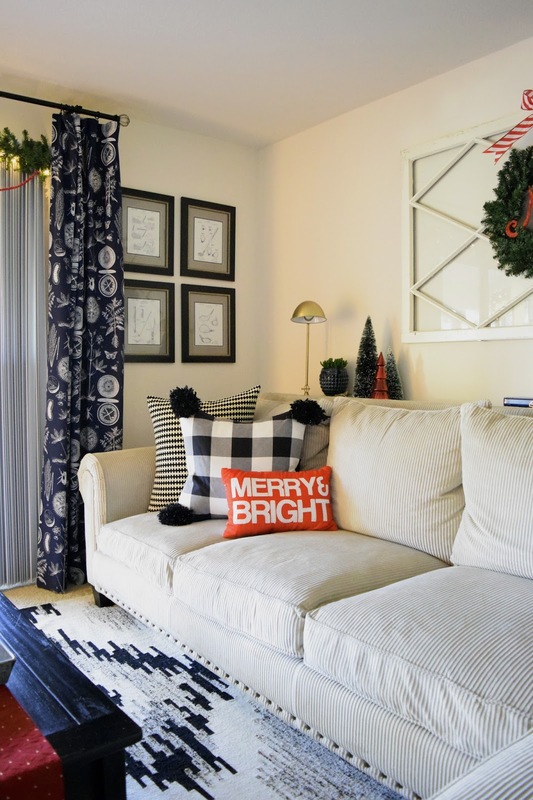 I swapped out the pair of black couch pillows for smaller red ones that read “Merry & Bright” and a wreath hung up by some candy cane ribbon replaces the round mirror. Excuse my horrible bow tying skills – I was running out of steam by the end! The long console table behind the couch (tutorial coming soon!) 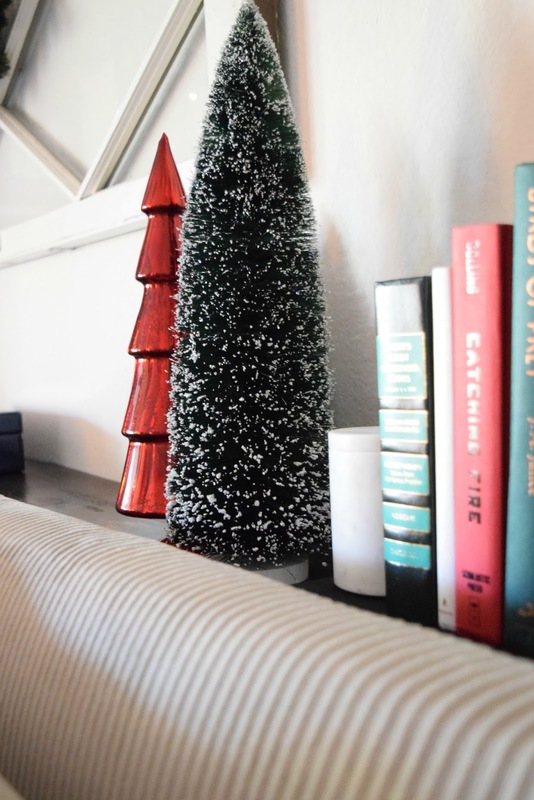 has a few bottle brush trees I picked up at Target this year which I paired with some red glass ones I already had. The only other change I made to the table was to change out the books on the right for more seasonally appropriate colors. 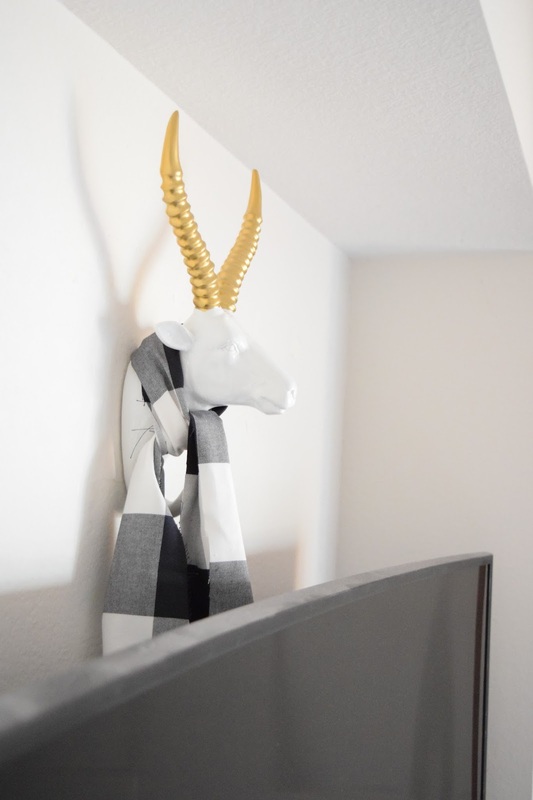 One of the things I love most about decorating is the ability to shop your own home, using what you have but giving it a twist to achieve the look you’re after – like giving the antelope a scarf, using the same hurricane candle holder but popping in a seasonally scented candle and vase filler, swapping out the mirror for a wreath, or using books in the right color pallet – all things I had on hand but helped sprinkle the festive touches throughout! 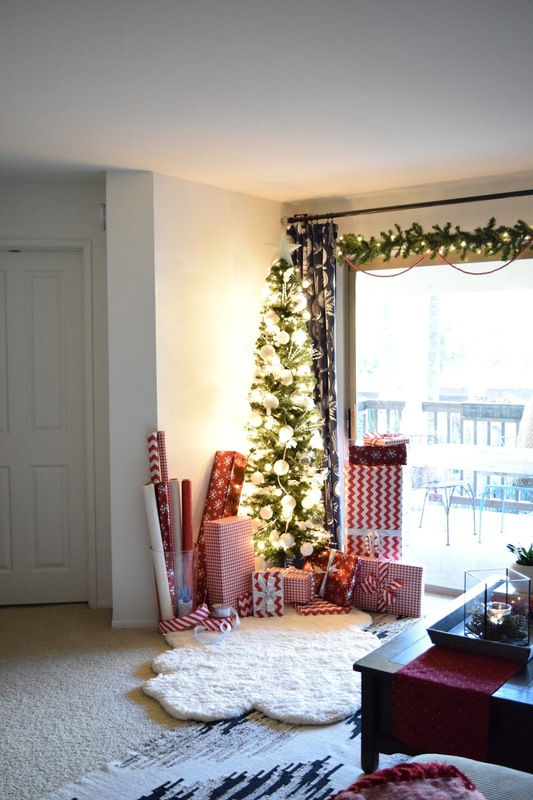 Directly across from the couch is the focal point of the entire room…the TREE! We purchased a new 7 ft. 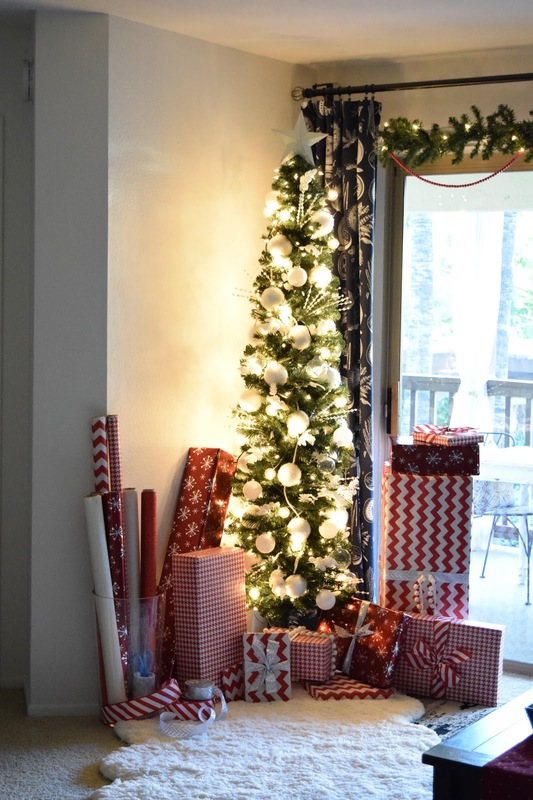 Slim tree from Michaels this year for $40 and at first I wasn’t sure I’d like it but now I LOVE it! It’s perfect when you’re limited on space just like us! I loaded it up and just love how it turned out. Our tree was already pre-lit but that didn’t stop me from adding two strands of round globe lights. I love the mix of the different lights and on the smaller tree I think it really pops! 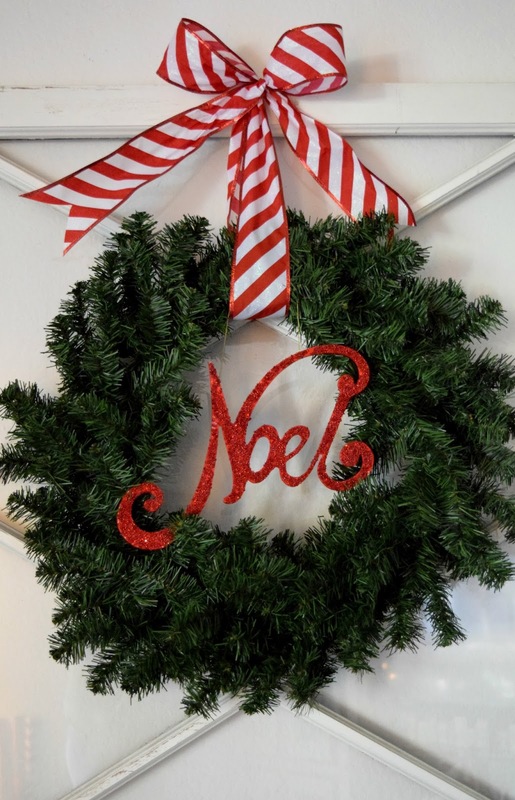 I also spotted this snowball garland at Target and added two strands of that as well. 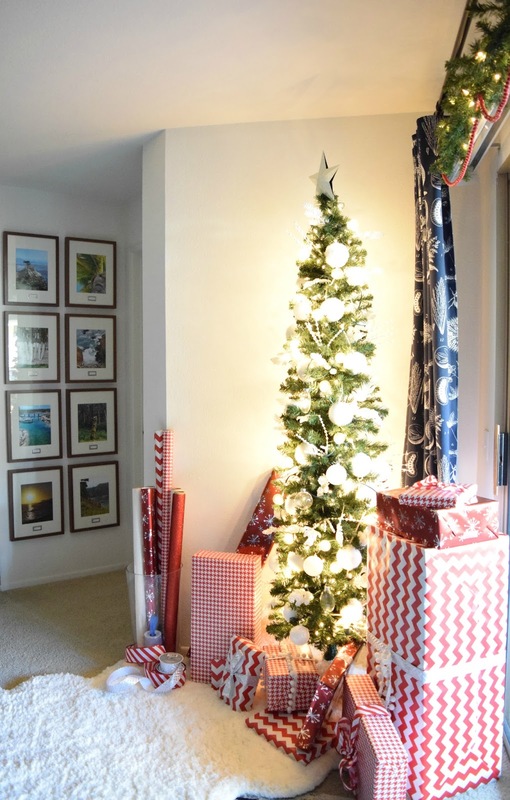 Think beyond regular ornaments for tree décor – anything is fair game! From there I added a lot of floral picks I got on major sale at Michaels and just a few actual ornaments I already had on hand – white glittery ones (because glitter is always better) and some clear ones for another added layer without taking away from everything else. 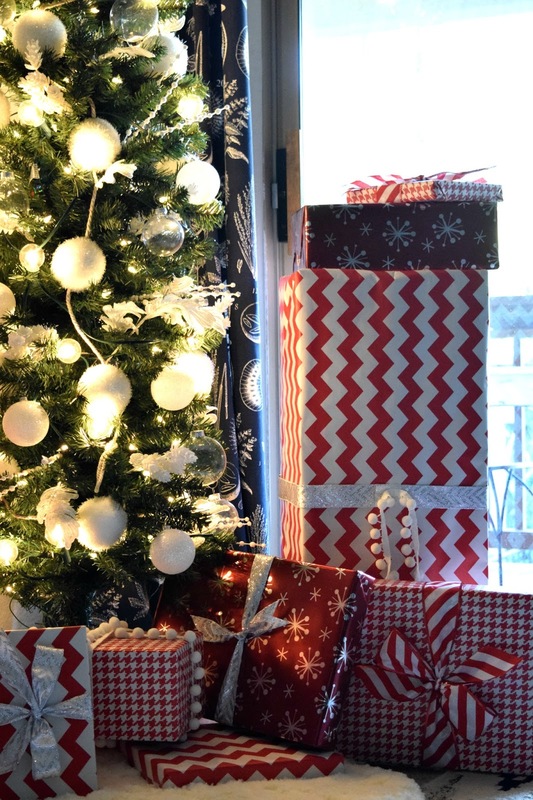 I set up a wrapping station using a glass vase which neatly corals my wrapping paper rolls, ribbons, tape, and scissors all while doubling as festive décor along-side the tree. 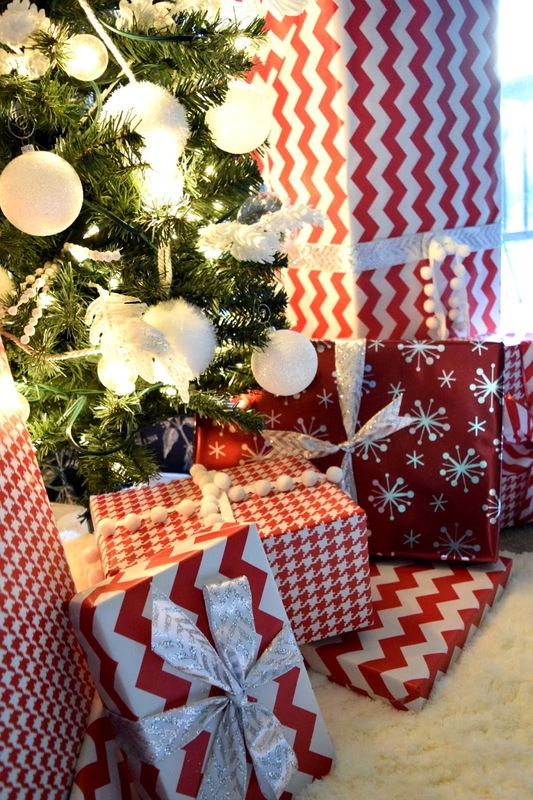 While rifling through my wrapping paper stash I noticed an abundance of red & white paper so I just went with it. 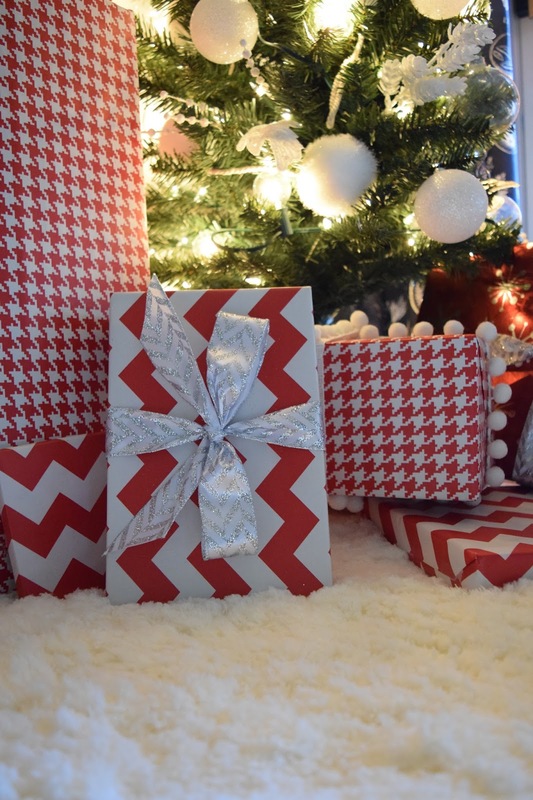 The red chevron and hounds tooth paper I found at the Dollar Store last year! The last stop on our Christmas home tour is the kitchen. 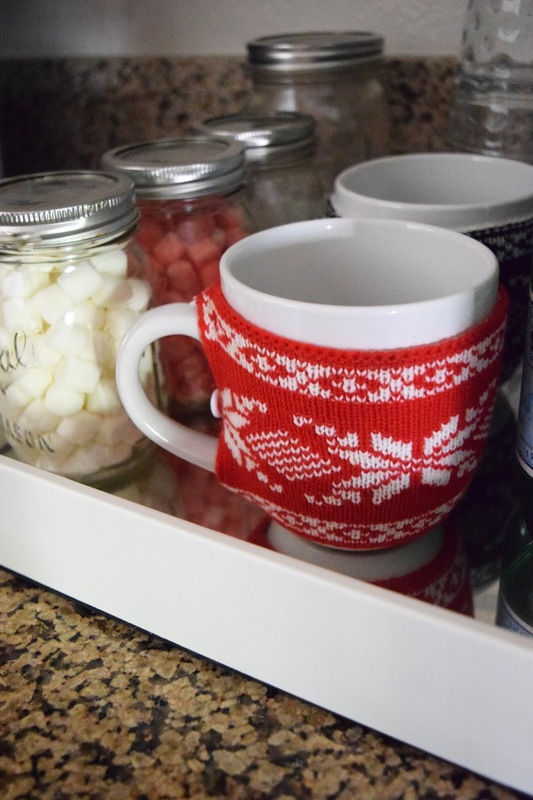 I added a few hot chocolate supplies – cocoa mix, marshmallows, and chocolate chips in mason jars to our bar tray. 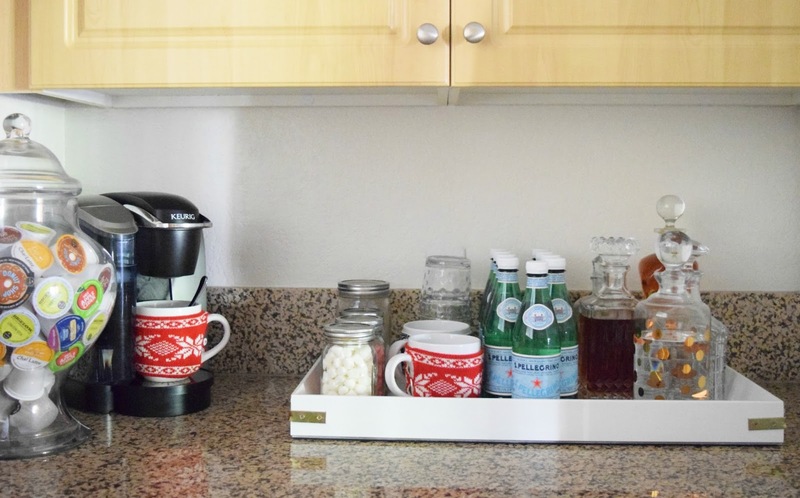 We just dump our hot chocolate concoctions to our sweater adorned mugs and fill with steaming hot water via the Keurig. Nothing better than a yummy cup of hot chocolate to cuddle up with on the couch! That’s all the Christmas I have to share with you from our little corner of the world – hope you enjoyed the tour and get a little inspiration to deck your halls this holiday season!